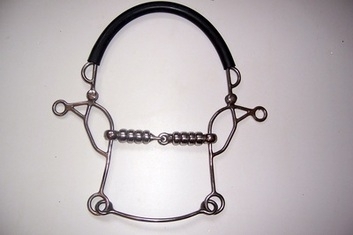 Cherry roller combination hackamore used on strong horses that require nose pressure and leveridge. Normally used with a sheepskin cover on the nose section. The cheeks attach to the little half moons by the rubber nose piece and the back strap to the outer small circles. The Combination Hackamores are available in many different mouthpieces, please contact us and we can order in what you require. These bits normally take around 2 weeks to come in.